Aretium Lappa, or Bardanus.�It is so well known, even by little boys, who pull off the bur to throw and stick upon one another that it needs no description. They grow plentifully by ditches, watersides, highways, and on waste grounds. It is a most excellent herb. It has been successfully used in many chronic diseases, as scurvy, rheumatism, gout, lues venerea, and affections of the lungs. It is a powerful diuretic, and it has been known to succeed in dropsical cases where other powerful medicines had been ineffectually used. As it neither excites nausea, nor increases irritation, it is worthy of a trial where more active remedies are improper. The seeds also possess a diuretic quality, and are very advantageous in stone or gravel, and in the form of an emulsion for coughs. A decoction may be made by boiling two ounces of the fresh root in two pints of water. This is excellent for provoking urine. It should be taken in one or two days. The leaves bruised and mixed with the white of an egg, is excellent for burns, scalds, etcetera. 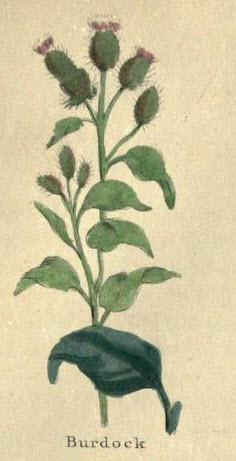 The decoction applied to sores stops gangrene; but the ointment of Burdock must also be applied. Powder the root and mix with hog's lard, and a little vinegar. In short, it is aperient, diuretic, and sudorific. It has cured dropsies alone, and has arrested the progress of fevers. In fact it is a most valuable herb; but its commonness is against it. Remember, that Providence has made some of the most useful plants the most common. The leaves bruised and moistened with Spirits of Hartshorn and Laudanum, form an excellent application for sprains, bruises, and other external injuries, it is good for old ulcers and sores.